A selection of high level routes to summits and viewpoints in the Alps in photo diary format. 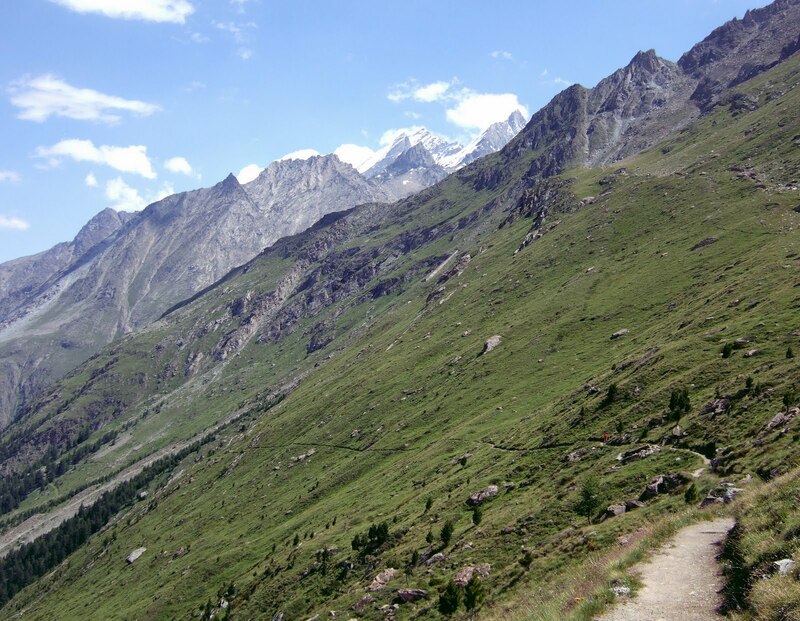 These routes are classed as walking or hiking trails rather than climbs and are not beyond the ability of the average hiker. 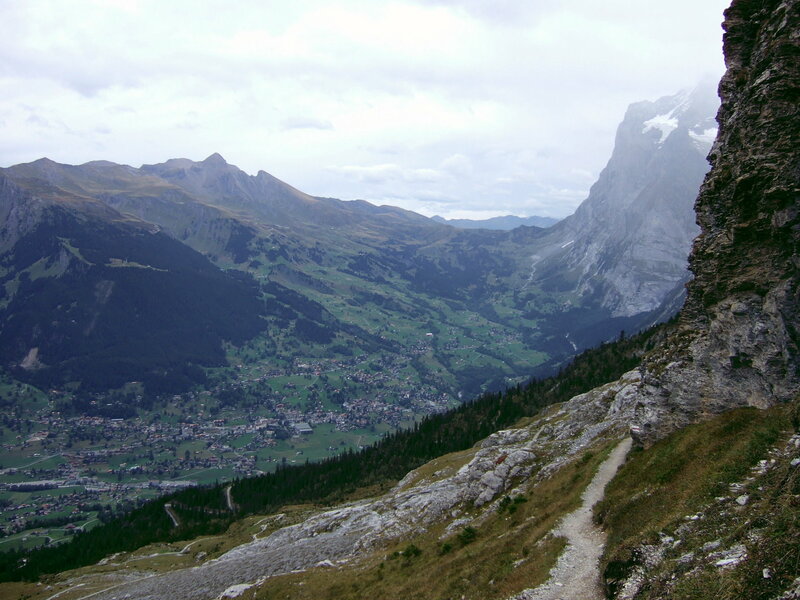 Also included here is my 8 day journey between the Eiger and the Matterhorn undertaken in July 2007.
from Chamonix and we left the track to join a path climbing the steep slopes to the right. 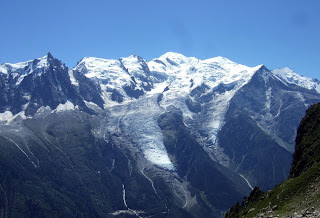 Below and opposite were steadily expanding views of the Chamonix Valley and the surrounding mountains topped by the vast white bulk of Mont Blanc. As we gained height the path skirted around the cliffs; always avoiding difficulties and leading steadily towards where the summit gondola station perched on the edge of the abyss a mile above the town of Chamonix which was spread out below us like a map. 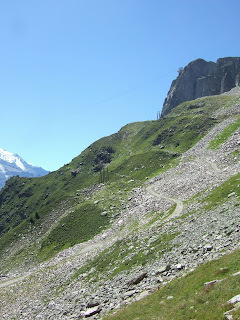 As the final sheer wall was approached, the path headed back up to the right and through a stony hollow before gaining the ridge without difficulty and rejoining the wider path from the Col du Brevent. That was the way back. 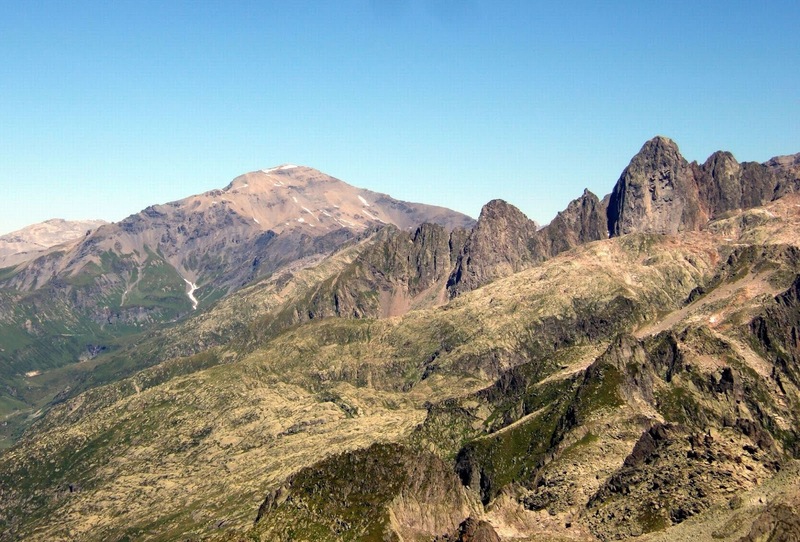 On the far side of the ridge is the wild and rugged terrain of the Aiguilles Rouges which is a nature reserve containing some wonderful hiking country while our route now followed the ridge beside a few snow patches on up to the summit which is just behind the summit station. 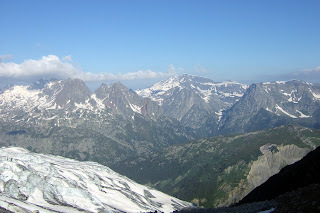 I have climbed the Brevent several times - usually from Planpraz - though this time with my eldest son Josh who has accompanied me on several outings - was the first time the view had been this clear. 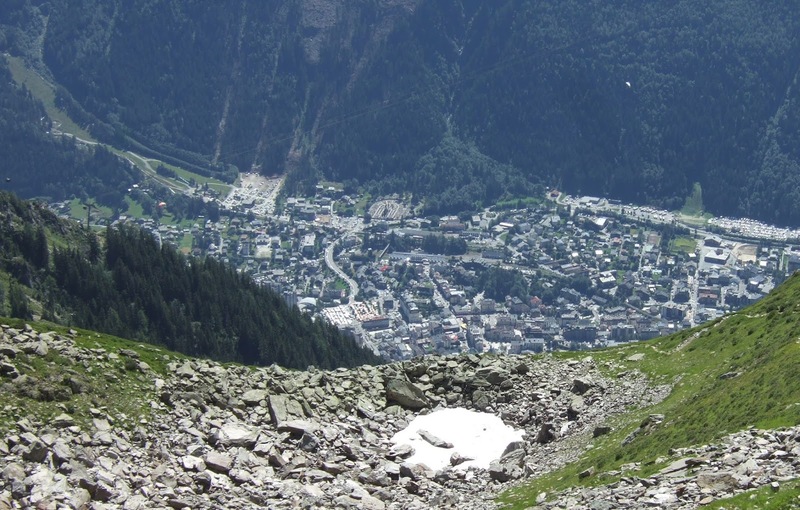 Most people journey here by gondola - the Telepherique du Brevent - for these views and they are worth every euro you pay for the ticket but the walk from Planpraz is not long and climbs only around 550m with the option of getting a ride down. peaks whose names are synonymous with mountaineering in Chamonix; the Aiguille du Chardonnet and Argentiere along with the Verte, the Dru and the Midi all rose sublimely into the alpine summer sky. The rough landscape of the Aiguilles Rouges north of here provides a contrast and leads the eye to Mont Buet while down valley and beyond the limestone plateau of the Desert de Plate, the Chaine des Aravis was outlined against the summer haze of the distant lowlands. In the cool stillness of the hour before dawn I departed the sleeping campsite in the Vallorcine valley at the foot of the Aiguiette des Posettes and followed the track by the railway to the Hotel du Buet. On the far side of the road that links Chamonix to Switzerland, a trail led steeply up into the forest above signposted to Cascade a Berard, refuge Pierre a Berard and Mont Buet. The sign gave me the thrilling news that the hike to the latter would take six hours - that was just one way. 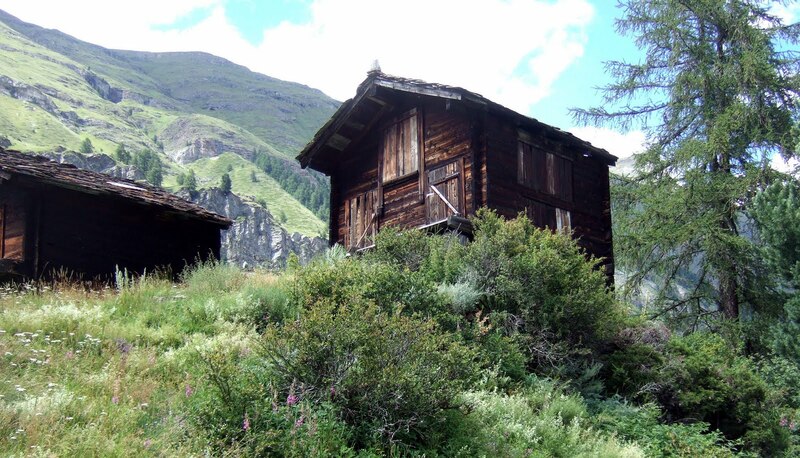 My objective was 1800 metres or 6000 feet above and in the interests of keeping this a family holiday I had opted to do the Mont Buet ascent in a single day and forgo the night at the hut. 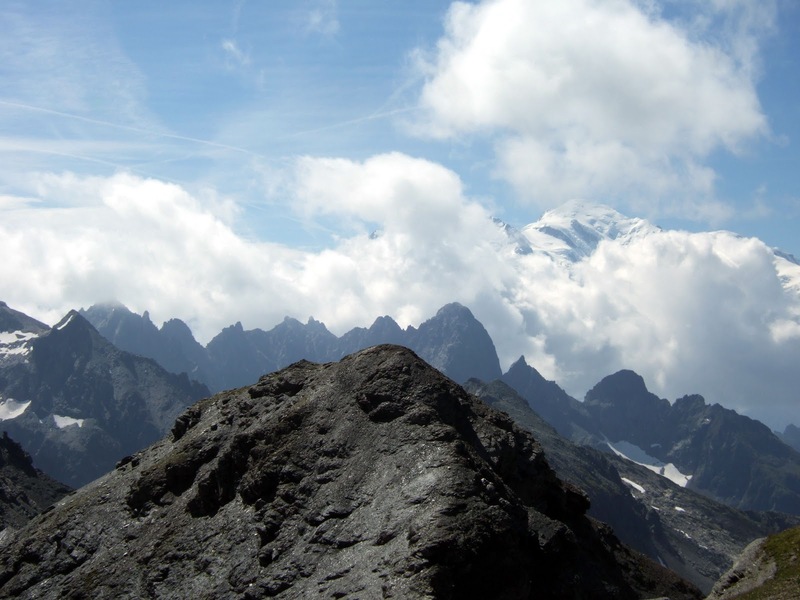 At 3099 metres or 10167 ft Mont Buet is the highest French mountain this side of the Chamonix Valley and the stunning views from the summit along with access by one of the highest marked hiking trails in the region make it a popular goal for the hiker. 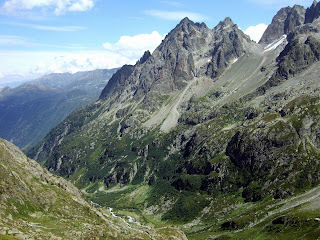 The normal ascent route from the pretty hamlet of Le Buet near Vallorcine is without technical difficulty in summer conditions the main challenge of the climb being the amount of ascent involved as well as well as heading into the zone where the effects of high altitude meke themselves felt. It was for these reasons that the mountain was known locally as Mont Blanc des Dames or Mont Blanc for the Ladies and used as both a practise climb for Mont Blanc itself or as an alternative. 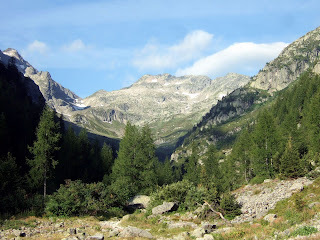 The early part of my ascent, steeply up through the coniferous forest requires few directions for a well marked path leads one higher into the Aiguilles Rouges Nature Reserve emerging from the trees into the remote feeling Berard Valley; a wonderfully untouched part of the French Alps. My route up the valley led a little way up the right hand slope before contouring along the slope. The path here seen following the river below forms part of a loop trail but either can be taken. The higher one is - surprisingly - less rough. The two paths meet again at the head of the valley where a final steep climb heads up to the Refuge Pierre a Berard at 1900 metres - the sun had risen now and I was warm as I approached the hut. 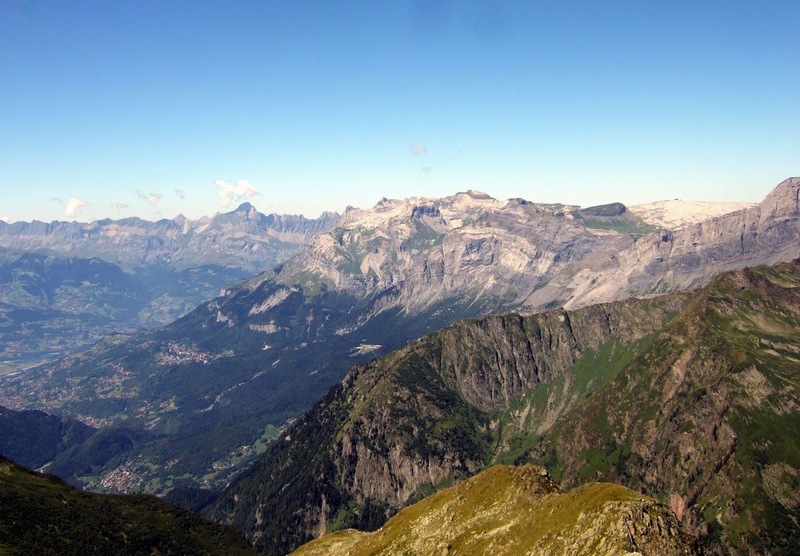 Orange juice from the fridge on a warm alpine day brought to mind A Long Walk in the Alps - my hike from the Eiger to the Matterhorn - I had climbed 2000 feet which was a third of the way. Beyond and to the right of the hut the path continues as though it means business; that climb to the hut steep? Nah... this is steep! 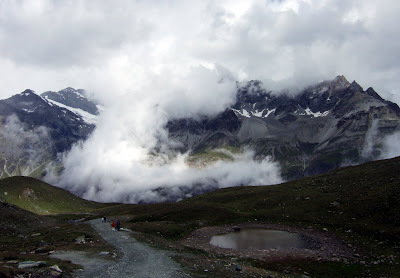 A relentless climb to high altitude through an environment that gradually becomes harsher the higher one gets. 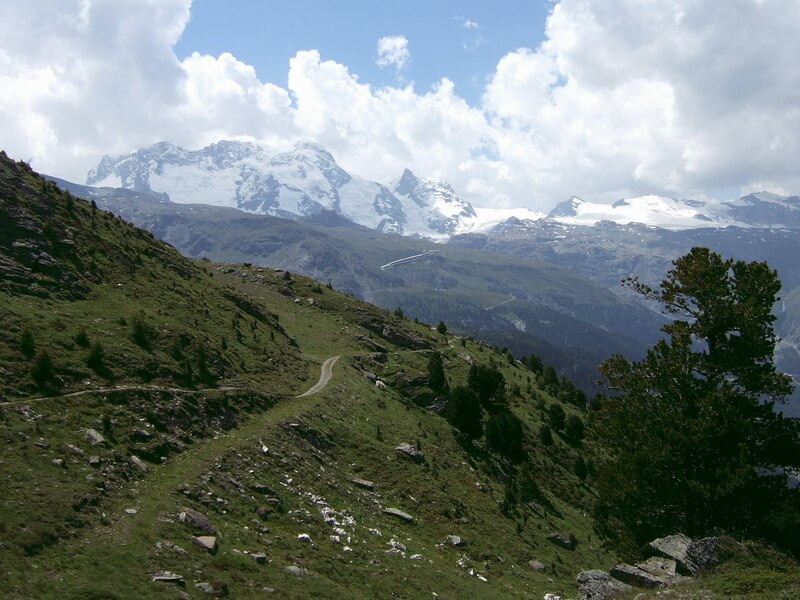 pretty soon I had left the grass of the Berard meadows behind as the path picked its way over the bare stone of the approach to the Col du Salenton at 2524 metres. Route finding issues on this ascent of Mont Buet are few but care is needed here. Cairns mark the way through the rocky steps and shelves below the col and while the way ahead is generally clear straying from the path can lead to more difficult ground. This area could be hazardous in mist when te route ahead cannot be seen. 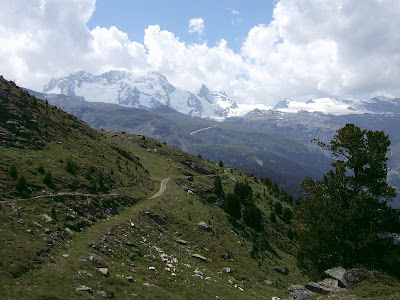 Just before the col I reached a path on easier shaly ground and turned right along it for Mont Buet - left takes you to the Col du Salenton just above. It's also worth remembering for this section to return to this point on the way down instead of using the apparent short cut seen below. That one had harder sections of scrambling to overcome. Now my route lay across a small snowfield and up a vast slope of gret shale which is often snow covered - the recent spell of warm dry weather meant that I didn't encounter much snow today. 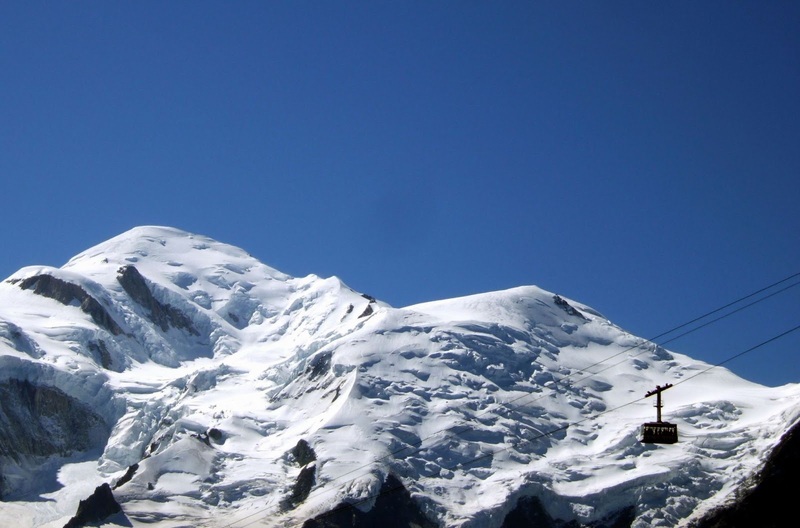 On most of my summer visits to the Chamonix area Mont Buet has been white topped. 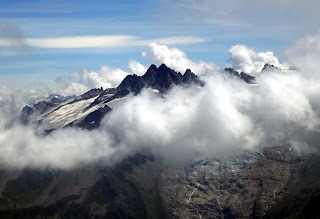 The altitude began to make itself felt as I ascended the ridge above and, now higher than the Aiguilles Rouges I paused for a rest looking back to Mont Blanc as its white form appeared through the drifting clouds beyond their jagged peaks. 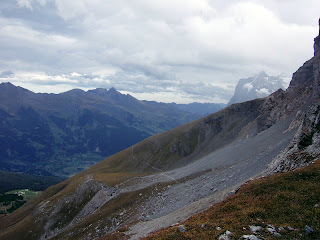 The next section was easy and a steady walk brought me up alongside a high valley towards the stomy snow streaked slopes that rose to the top of Mont Buet. The mountain however was not giving up this battle lightly and my pace slowed as the path headed up a series of switchbacks on a never ending slope of steep shale. The antenna above drew me on. 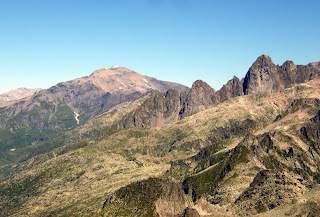 It marks the end of the ridge known as the Arete de Mortine, and is in a wonderful spot with views in three direcions from ten thousand feet up in the sky though I took the most inspiration from how easy the last part to the summit looked. a stroll on a wide ridge up to the cairn. The summit view from Mont Buet is worth all the effort; in the South the snowy peaks of the Mont Blanc range shone under a summer sky with the white river of the Glacier d'Argentiere leading into their midst and the King of the Alps Mont Blanc standing aloof at their southern end. Closer the rocky spires of the Aiguilles Rouges hid the intervening Valee du chamonix from view while further west I could clearly identify Le Brevent where I had stood two days earlier with Josh looking up here to the mountain I'd planned to climb while to the North deep valleys hid beneath the clouds. 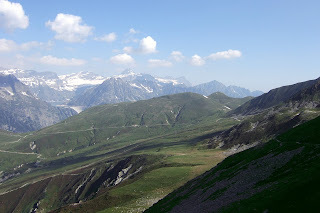 The heat haze hung over the low lying Rhone Valley in switzerland while up here at 3099 metres I put on a coat against the chilly breeze. 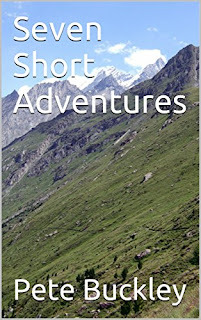 Close at hand there was an unusual perspective of the Dents du Midi seen across the wild country of Emosson while that side of Mont Buet plunged in a forbidding drop to the unseen depths of the Tre les Eaux Valley. 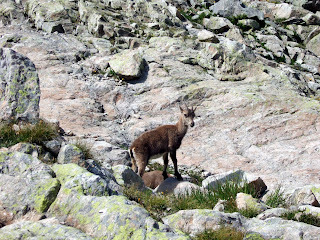 One thing worth mentioing on te way back were the chamois I saw below the Col du Salenton. 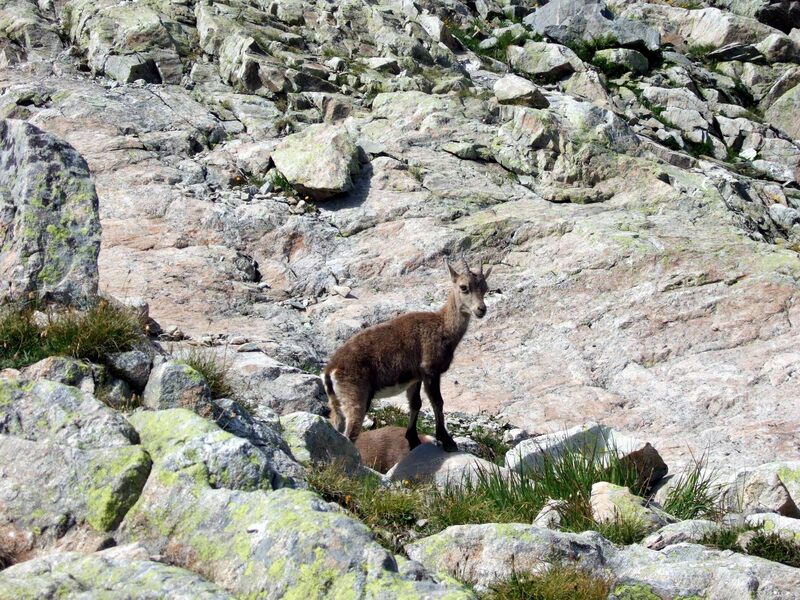 They are a timid creature and one always privileged to see them and this was only the second time I had seen one in the Alps. 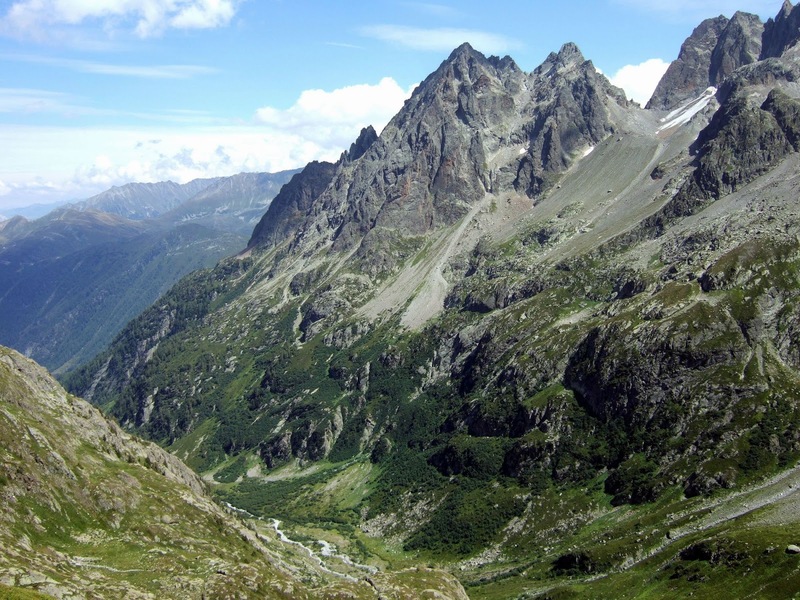 One of the more popular hiking routes from the Chamonix Valley is the walk to the Albert Premier Hut or Refuge Albert Premier - high above the alpine hamlet of Le Tour at the head of the valley. The hut itself is situated at an altitude of 2702 metres overlooking the ice seracs and crevasses of the Glacier du Tour but despite the high altitude and spectacular position it is a fairly easy walk along a good path. 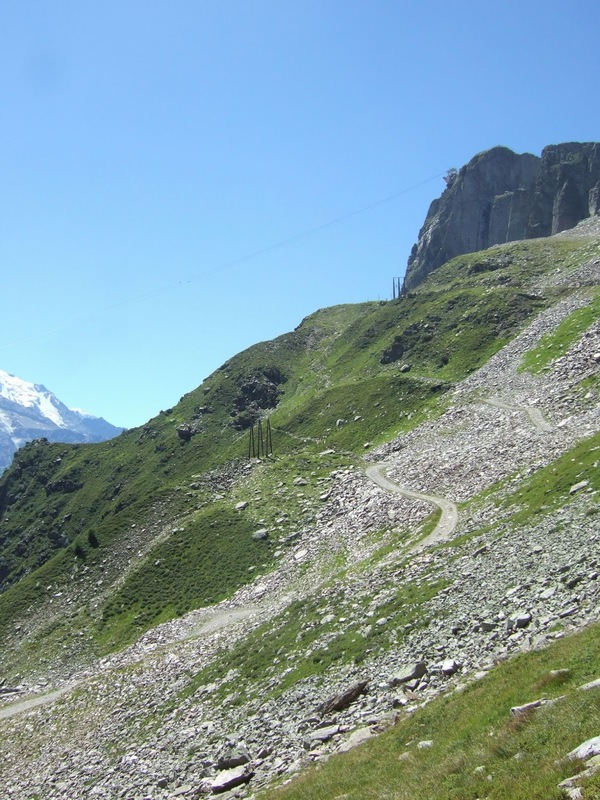 You can start the walk in Le Tour but it's a long day from there - most hikers to the Albert Premier take the gondola to Col du Balme up by the Swiss Frontier from where a good path leads in roughly a southerly direction at first to gradually ascend around the hillsides by an easy route. The first picture shows the col de Balme area from the early part of the route. After perhaps a mile the path passes the Lac du Charamillon which is just above on the left and is a wonderully peaceful spot - this track can be busy during fine weather. 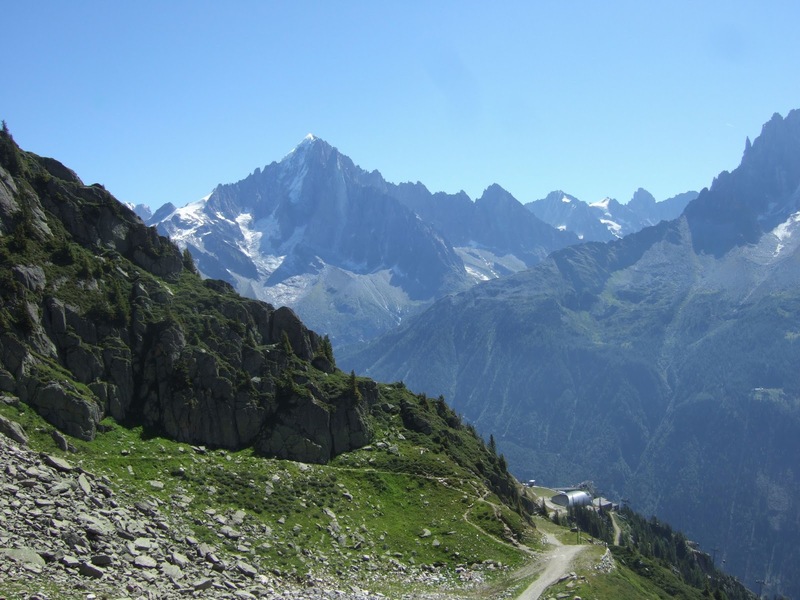 A little further and the route tops the ridge ahead and turns to the left where spectacular views open up ahead of Mont Blanc and the vista down the Val du Chamonix. 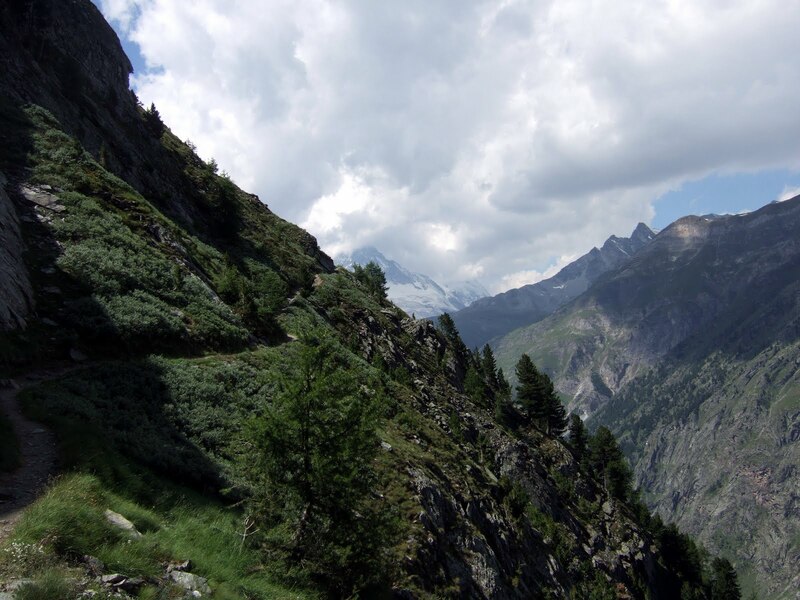 There follows a short rocky section protected by a rope handrail - no difficulty - and the route heads on towards the Glacier du Tour over boulder strewn hillsides. At the glacier the path bears left up the steep moraine and meets the direct route from Le Tour which comes up from the right. 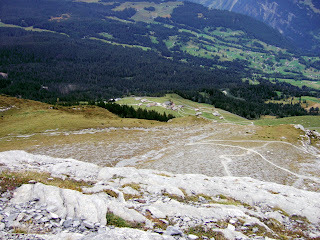 Now a steady climb of the moraine takes us directly up to the hut which can be seen above. 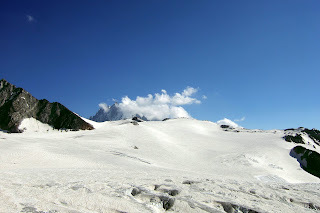 The last part is often snow covered but you don't go onto the glacier itself which is below on the right. The views from the Albert Premier are stunning with the Glacier du Tour as a centrepiece. 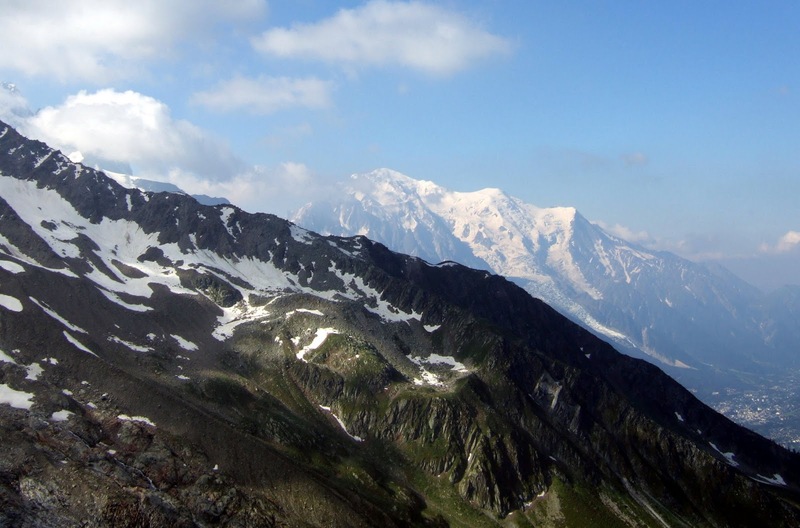 The high peak on its far side is the Aiguille du Chardonnet (3824m) while the rocky summit beyond the refuge is the Aiguille du Tour (3540m) - a popular climb from here. 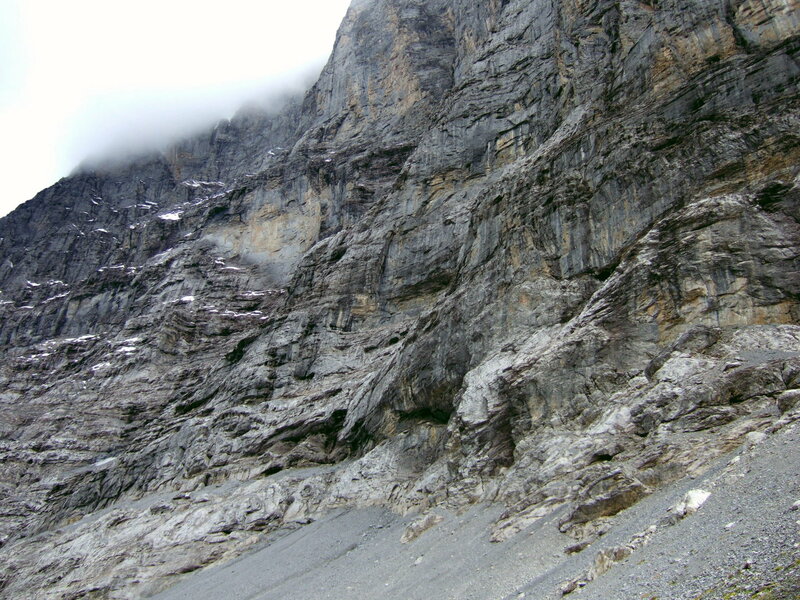 This ascent is not difficult but you need ropes as it goes onto the glacier where there is a crevasse danger. The panorama across the valley is just as awesome with the jagged peaks of the Aiguilles Rouges rising from the wooded valley and the usually snowy peak of Mont Buet (3099m) topping the Emosson Peaks - a view which has accompanied us most of the way from Col du Balme. gondola down - the path straight down does go to Le Tour but it's steep, rough and generally not as easy as the ascent route was. It is about 4.5km or a bit under 3 miles from the gondola to the refuge and the path climbs about 600m or 2000 feet in getting there. From Le Tour it's twice the climb. The Eiger Trail route is described briefly in an upwards direction on day one of my Grindelwald to Zermatt trek but here is a more detailed description of one of the most enjoyable walks in the Jungfrau Region heading downhill from Eigergletscher to Alpiglen which is how many choose to do this walk. 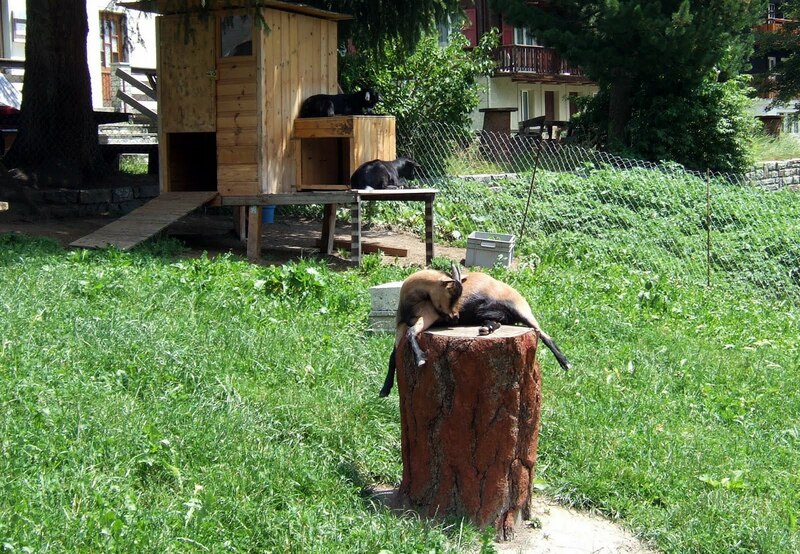 The lack of effort needed means one can concentrate on enjoying the stunning views! The following is an exerpt from Tales from the Hills. ridge. I wasn't going to attempt to go much further up anyway, the way being barred by the huge rock pillar of the Rotstock rising up towards the top of the Eiger. 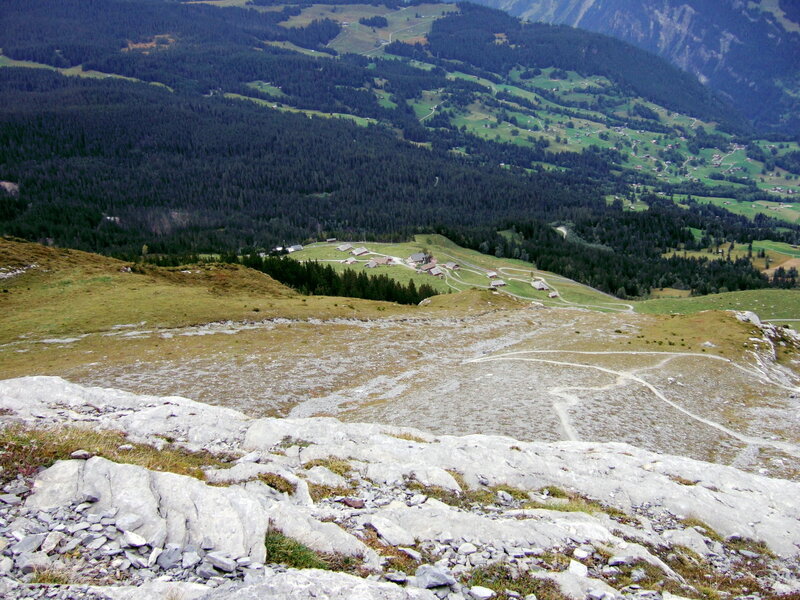 Descending all the time, the track led across a vast stone filled hollow. 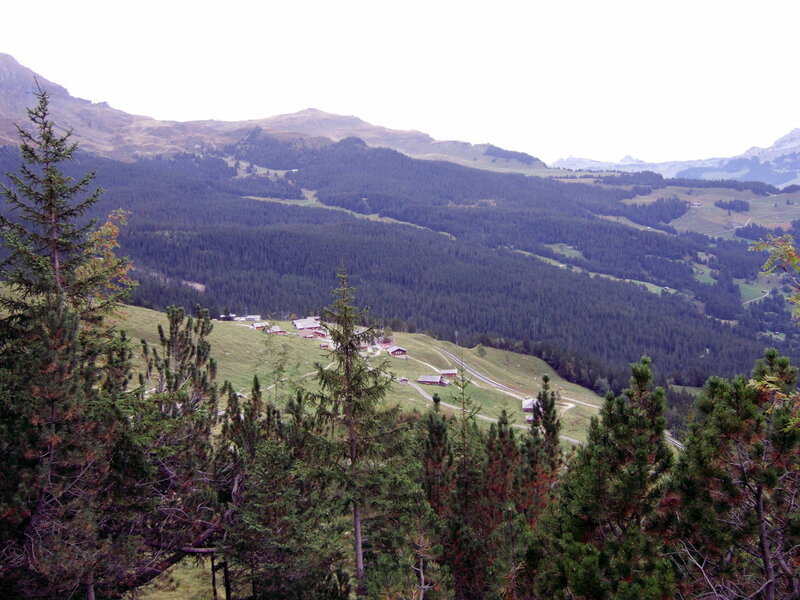 Down on the left were the meadows below Kleine Scheidegg with glimpses of the railway running through the trees beneath a long scree slope. 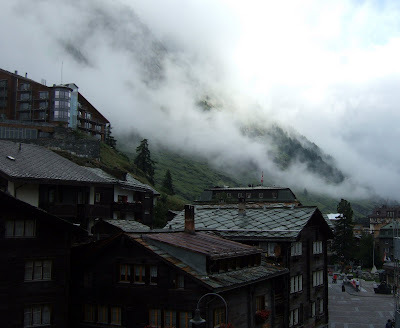 Above on the other side, the slope rose to the base of grey cliffs which seemed to rise up forever, their tops hidden in the swirling cloud above. As I neared the bottom of the stony hollow, there appeared a large number of small cairns on the hillside. I can only assume they were memorials to those climbers who lost their lives climbing the face. It was however, a strangely peaceful spot, the view over the valley tempering the harsh rugged scene. I was reminded of the dangers by a distant crashing above; rock fall, one of the main dangers of climbing here. The rain had started again but was only light as the route began to traverse a wide ledge onto a rocky section below the Mittellegi Ridge. There were good views down to the valley from this bit and below an impressive waterfall the path veered off down to the left zig zagging steeply down. There were no difficulties however and I finally crossed a small footbridge over a mini gorge worn in the limestone by the river. The path I was on now joined another which crossed the hillside lower down. 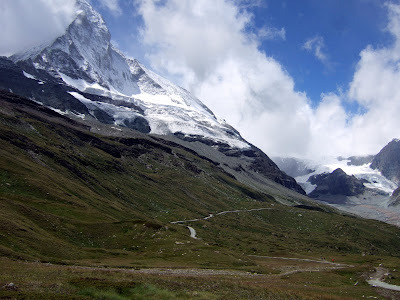 So the journey to Zermatt is over but as I started the route with the Eiger Trail it made sense to finish properly with the Matterhorn Trail for an up close view of the mountain and its surroundings. 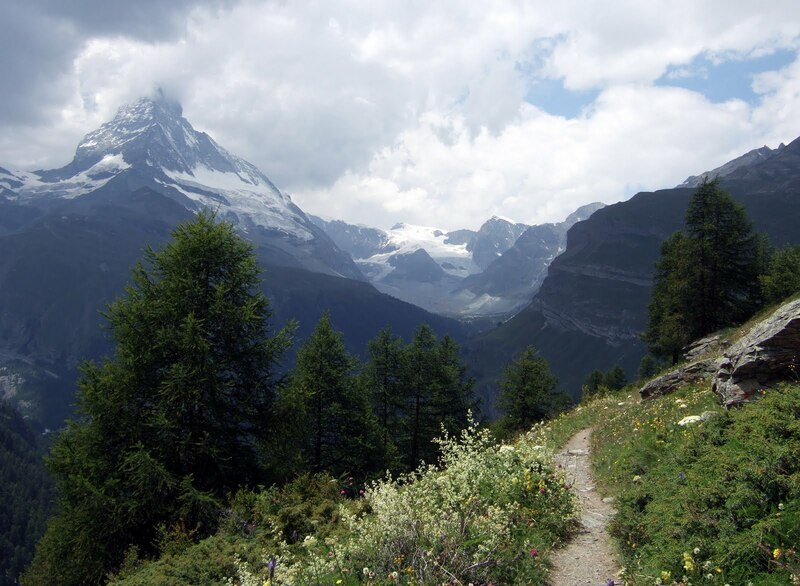 The Matterhorn Trail can be done in either direction. If starting at the top - which is the way it is usually done - the cable car is taken to Schwarzsee at 2583m to begin the 10km descent to Zermatt. The path is easy throughout with wonderful views. 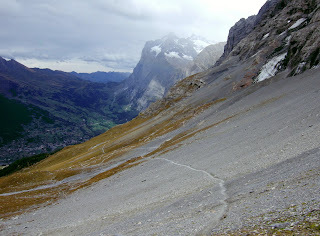 In an upwards direction the route involves an ascent of 1000m which I suppose is why most choose to go downwards. 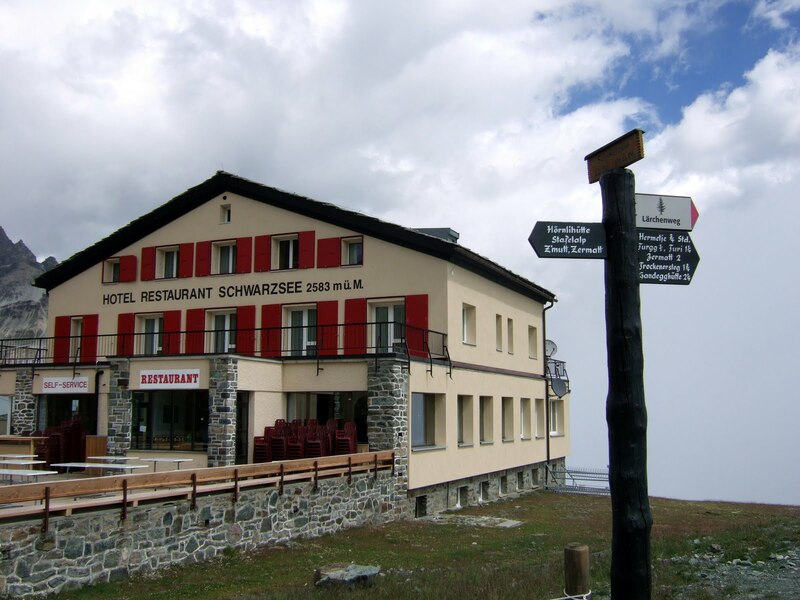 Sustenance can be obtained at the Hotel Restaurant Schwarzsee which is a short distance from the gondola station. 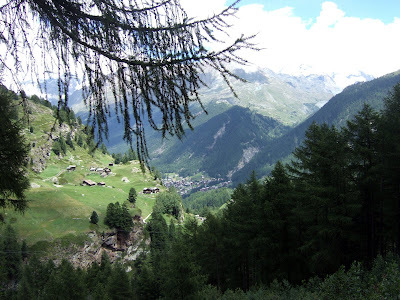 This is the start of the Matterhorn Trail in a downwards direction or the finish if you have walked up from Zermatt in which case the gondola will be very welcome! The beginning of the Matterhorn Trail in a downwards direction. 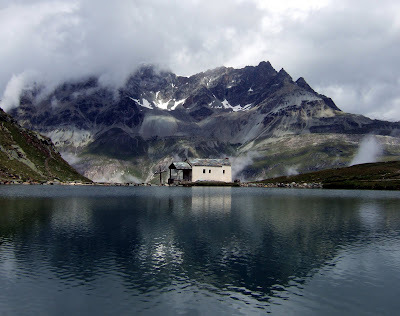 The small chapel of Maria zum Schnee - Maria of the Snows - beside the mountain tarn of Schwarzsee a short way down the trail. The tarn is at the foot of the Matterhorn's Hornli Ridge. The North Face of the Matterhorn dominates the view in the initial stages. Looking back up towards the Matterhorn from Stafel where the forest is once again reached. Views down from the Matterhorn Trail below Stafel towards Zermatt in the valley. 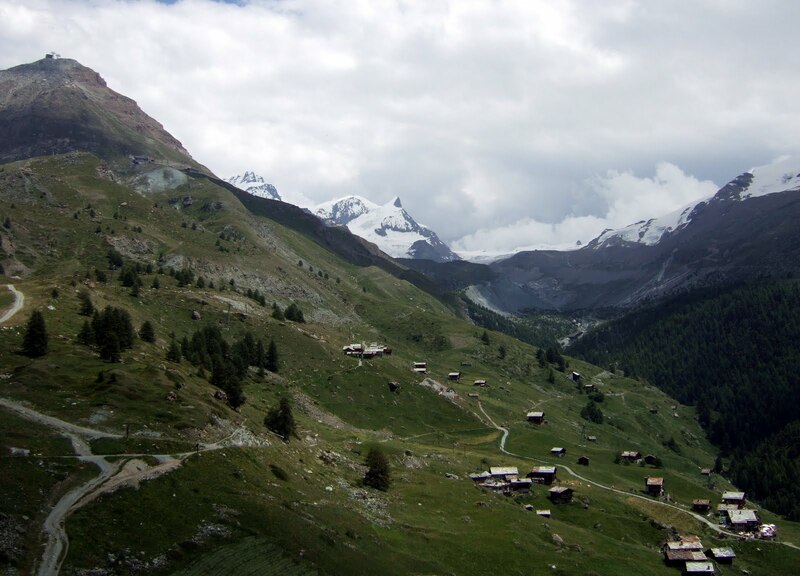 Haybarns near Zmutt typify the lower part of the trail as it returns to the valley. The most direct route from Randa to Zermatt would be to continue on the valley paths which would make for a pleasant and easy walk but though I followed these from Randa to Tasch - the next village going towards Zermatt - I took a steep path up through the woods east of Tasch (the one south of the Taschbach stream) towards Taschalp which is also known as Ottavan. When the wide easy path of the Europaweg is reached about 700m above Tasch, turn south (right) towards Sunegga and Zermatt instead of continuing to Taschalp which is still about a kilometre in the other direction. If you have followed the trail north of the Taschbach gorge then you will pass Taschalp where refreshments are available. Either way this is one of the best days of the route with most of the climbing done early leaving the ever improving views to be enjoyed for little effort. If you want more effort then walk the full Europaweg from Gasenried (postbus from st Niklaus) instead of going to Randa. That way is much harder than this one which is a relatively easy walk of about 16km or 10 miles. 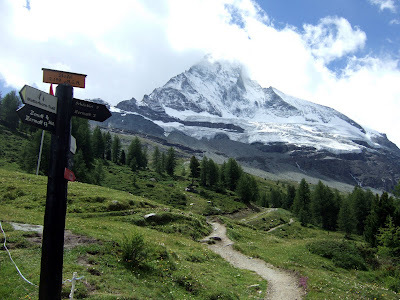 A first view (almost) of the Matterhorn (4478m) from a section of the Europaweg trail above Tasch. 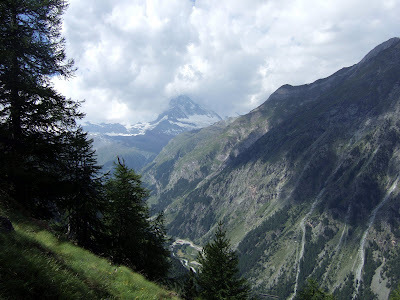 This section of the Europaweg is a fascinating trail traversing the steep slopes above the Mattertal. On this trek we effectively do the last third or so of the Europaweg which on its own is a two day hike. The last section is interesting but fairly easy. Looking back to the Mischabel peaks. 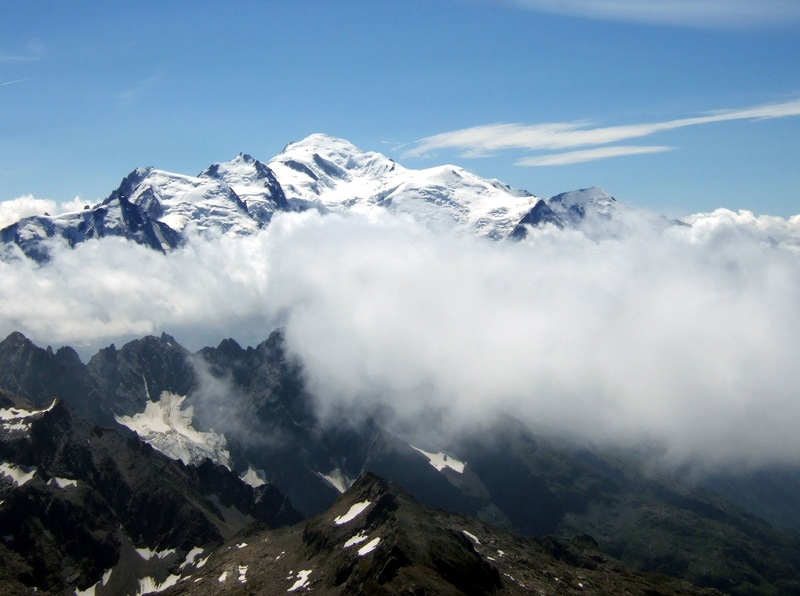 The central summit of the Dom (4545m) is the highest mountain entirely within Switzerland - Monte Rosa being on the Italian frontier. 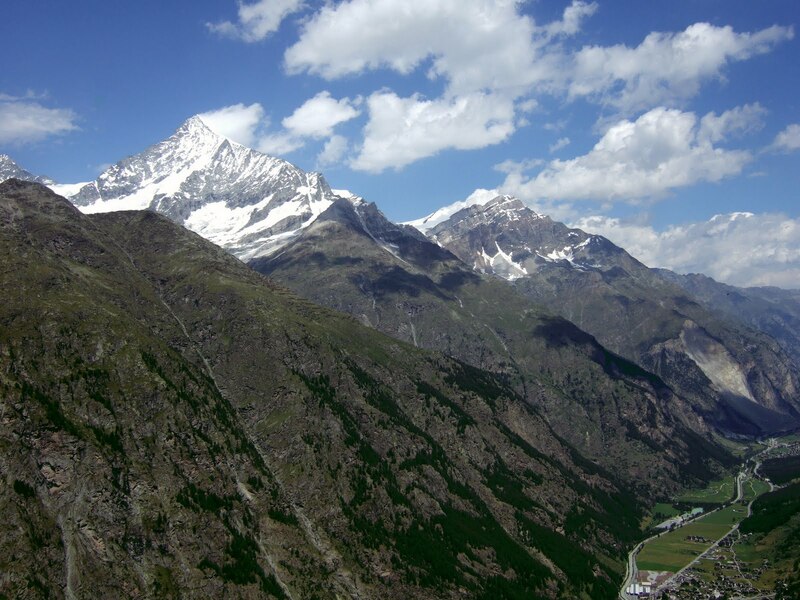 Across the valley rises the Weisshorn (4505m) one of the most impressive of the peaks here if not so famous as the Matterhorn. 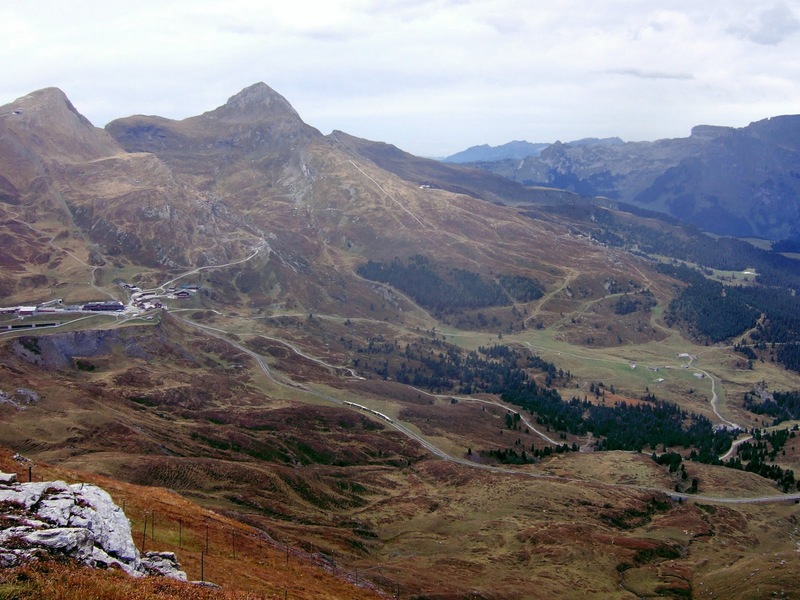 The meadows of Findeln beneath the Rothorn (3103m) with the cable car building visible on the summit. There is a shorter way to Zermatt direct from Tufteren but this is surely the finest approach. The path descends now in its final approach to Zermatt while the Matterhorn towers overhead. 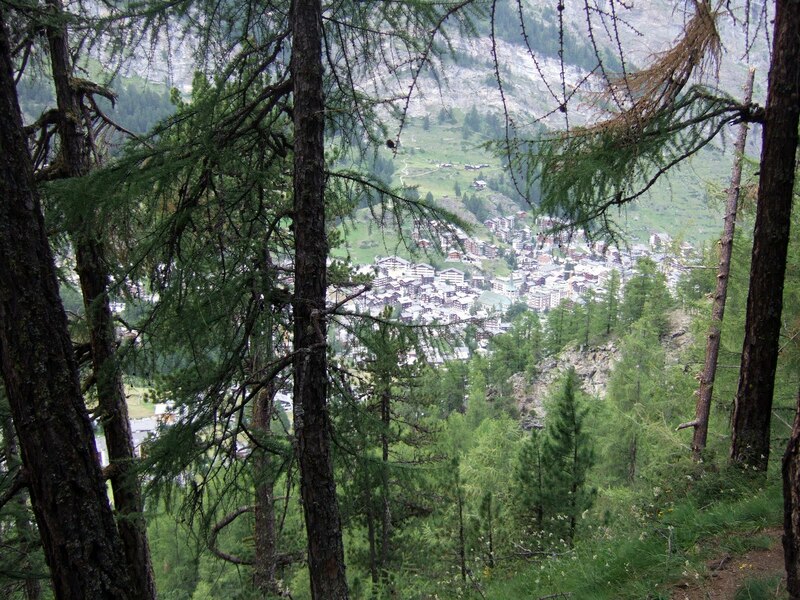 The rooftops of Zermatt appear through the trees. We are almost there. The view from my hotel balcony. I arrived just before the weather came in. 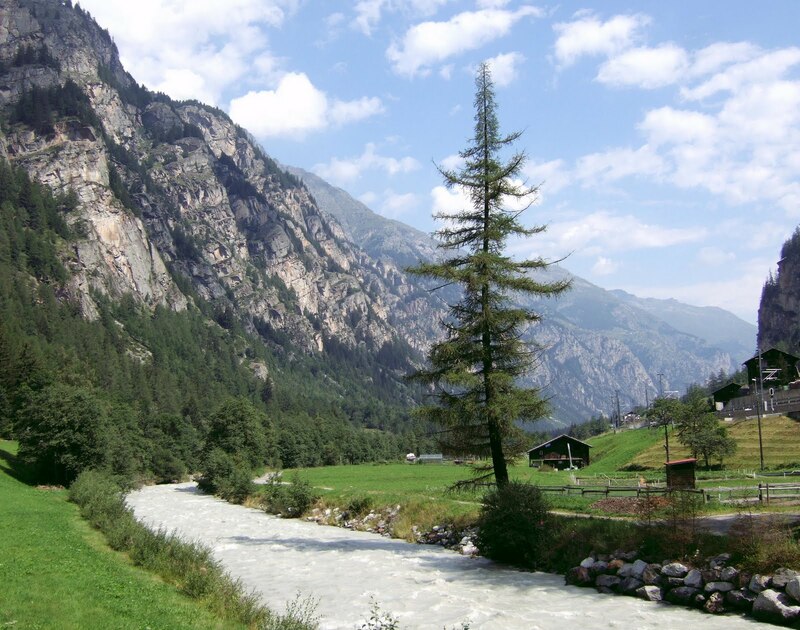 A rest day really after the rigours of the High Alps where one can enjoy a leisurely stroll along the banks of the Mattervispa - the river descending from the glaciers up beyond Zermatt. 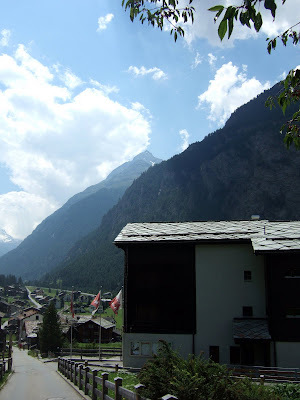 The villages and meadows of the Mattertal are quite charming and best seen from the trail rather than the trains packed with Zermatt-bound tourists. A pleasant valley trail leads alongside the Mattervispa river near Herbriggen. The landslide debris between Herbriggen and Randa. 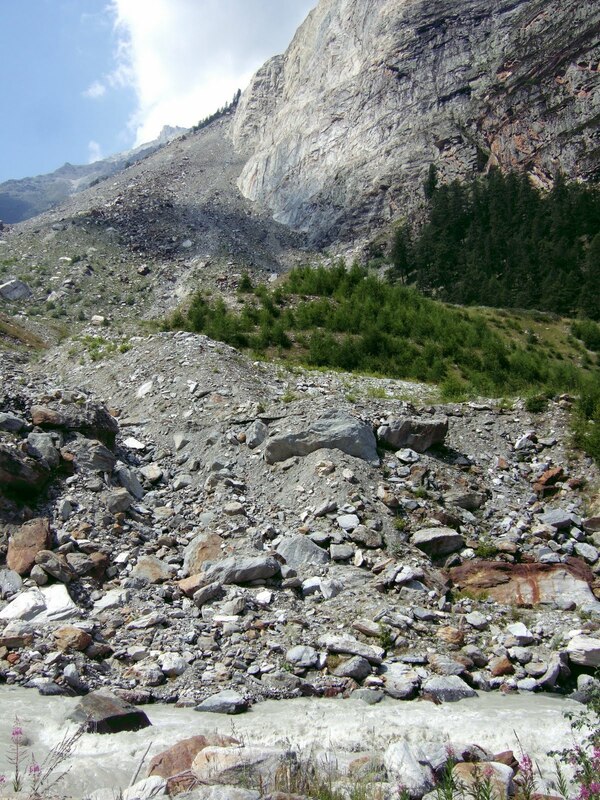 The massive slide occurred in 1991 and is a reminder that the Alps here are still being shaped by nature. 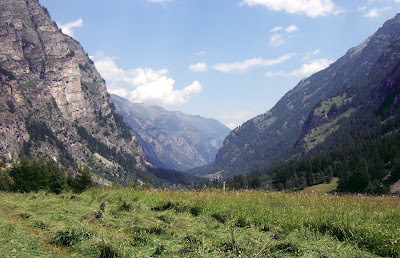 Looking back down the Mattertal from the final rise through the meadows just before Randa. 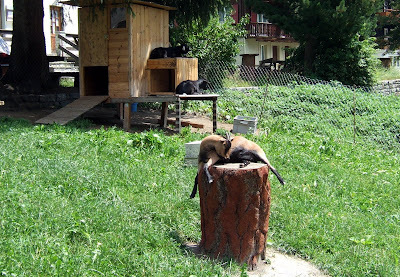 A typical garden in Randa, goats and all. The main street of Randa will make the route out of town the next day. 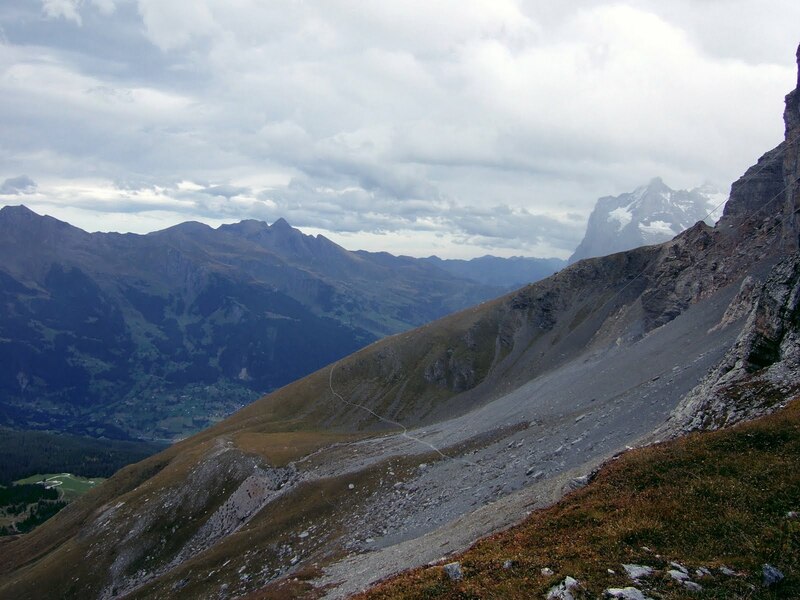 Looking up the valley towards the Mettelhorn (3406m).